I reserve the right to make a non-crime-fiction post every few months, and I think it's been a few months since the last one, so . . .
Today's principal activity was a stroll along the avenue des Champs-Élysées that culminated in a half-hour or so of reading in the Tuileries, where reasonably comfortable chairs are provided for the purpose or for sitting and watching the birds. In the U.S., the chairs would be of concrete, bolted down, stolen, or eliminated by a local government that has no time for such fripperies. Yesterday, I visited the Pantheon, which is as awe-inspiring as any great church you'd care to name. That's appropriate, since it used to be a church. Of course, the church was modeled after a "pagan," Roman building. Not only that, but right from the beginning, the church borrowed its administrative structure from those same Romans. From pagans ye came; unto pagans thou shalt return, as some waggish member of the Convention surely must have said sometime in the 1790s. The tombs of Rousseau and Voltaire face one another in the building's crypt. The remains of many great Frenchmen and at least one great French woman also repose there. This woman achieved epoch-making discoveries, as outlined in a short display just outside her tomb. The display includes pictures, and I noted that she was rather attractive. In fact, if not for the danger that I would be accused of outrageous word play, I might even say she was hot. It transpires that more Parisians than just the woman on the Metro read French translations of Donald Westlake. A number of Paris bookstores stock fairly generous selections by that great American crime novelist, better selections than does my friendly neighborhood chain store back home, for instance. I'd noticed, however, that the stock in Paris was heavier on Westlake's standalones than on his series about John Dortmunder and his burglar friends. Perhaps, I thought, French readers don't go for comedy with their crime. This afternoon, though, I found a store that did carry two of the Dortmunder novels in translation, but I still may have been partly right. The cover of Au pire, qu'est-ce qu'on risque? (What's the Worst That Could Happen?) is surprisingly dark for a comic caper novel, especially one whose film version co-starred Danny DeVito. But then, the nation that gave the term film noir to the world may just have a predilection for darkness, shadows and harsh contrasts. I found some intriguing historical crime fiction today, a series written in French by the Vietnamese sisters Thanh-Van and Kim Tran-Nhut about a young magistrate in 17th-century Vietnam. The books have been translated into Japanese, Spanish, Russian and Italian, but not — stop me if you've heard this before — into English. Somewhere in America . . .
. . . a publisher's representative is scratching her head this week wondering why the books she sent me were returned unopened. The short answer is easy: Federal Express®. The long answer ought to make shippers reconsider the virtues of the post office. Last Friday, I found a tag on my door informing me that FedEx® had made a final attempt to deliver a package. This puzzled me, as it was the first indication I had received of any attempt. The polite and businesslike young gentleman who answered my complaint told me that nothing obliges the delivery person "by law" to leave any such indication. "Maybe they ran out of forms," he said, his voice unwavering, with no hint of embarrassment, apology or irony. The man has a bright future in corporate America, but I don't have my books. I'd still like to see them, though. So, publishers, keep those books coming, but don't send them by Federal Express®. Paris, city of crime, part II: Yesterday I saw a woman on the subway reading a French translation of a Donald Westlake novel. I've admired the work of Siân Reynolds, translator from French into English of the crime novelist Fred Vargas and the historian Fernand Braudel. In particular, I liked a note that Reynolds appended to Wash This Blood Clean From My Hand, her Dagger-winning translation of Vargas' Sous les vents de Neptune. That novel takes Paris police Commissaire Jean-Baptiste Adamsberg and his colleagues to Quebec, where tension ensues with their Canadian counterparts. Among the sources of the tension is misunderstanding due to idiomatic differences between Quebecois French and the French spoken in France. Reynolds explains that she excluded that aspect of the misunderstanding from her translation, fearing (probably rightly) that it would be impossible to render successfully into English. What started with Poe and continued with Humphrey Bogart and David Goodis persists to this day. France still loves American crime fiction. The French movie version of Gil Brewer's novel 13 French Street opens this week. Also on the cultural agenda: A stage production of Crime and Punishment (Crime et châtiment in the local tongue) opens with an all-Lithuanian cast. And we took a stroll along boulevard Richard-Lenoir this evening. Perhaps I'll knock on the door at Number 132 tomorow to see if Mme. et commissaire Maigret are at home. 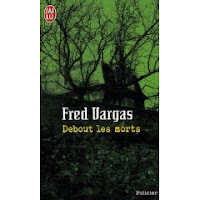 Finally, a copy of Debout les morts by Fred Vargas (The Three Evangelists, in its English version) caught my eye in a bookshop at the Gare du Nord this afternoon. If I make suitable progress reading this excellent and highly entertaining French crime novelist in her own language, I'll be sure to spread the news. Michael Walters’ blog links to this fascinating analysis of book-jacket design, in this case for the U.S. edition of Walters’ own novel The Shadow Walker. The designer/illustrator/blogger in question, Richard Tuschman, walks the reader through jacket design in a way I suspect you will find most enlightening. Needless to say, his blog looks good, too. Events have turned my mind to origins, not of species, but of crime-fiction characters and teams. First, as part of my cautious embrace of historical crime fiction, I borrowed a book of Ellis Peters stories that illuminate the origin of Brother Cadfael. Then a reader’s comment spurred me to recall “The Last National Service Man,” Reginald Hill's 1994 story of Peter Pascoe and “Fat Andy” Dalziel’s first meeting. The stories share at least one feature: Each was published when its series was well established, twenty-four years after the first book in Hill’s case. And now, readers, what are your favorite crime-fiction origin stories? Why did you like them and, more generally, what are the attractions of such stories? Were your favorites the first in a series, or did the author go back years later to explore the origins of established characters, as Hill and Peters did? "Inspired by the industry of his colleagues, Siri went directly to the ward of private rooms, found one empty, and lay back on the starched sheet for a brief rest. He woke four hours later. He considered this his contribution to the project. A team needs an alert, conscious leader. To make himself even more qualified for the job, he stopped off at the canteen for noodles. These were the leadership qualities he most admired in himself." Your questions, readers, are this: What older crime-fiction protagonists can you think of? What role does their age play in the stories in which they appear? "Eoin Colfer’s `Taking on PJ' is another highlight. It takes a special kind of alchemy to mix violence with laugh-out-loud humor and make both work. No one does it better than Bruen himself, and Colfer is just about as good. It’s no wonder Bruen chose `Taking on PJ' to open the collection. With its accent and its attitude, there’s no mistaking where this one takes place." I loved the story, looked for more by Colfer, and only then discovered he also wrote for young adults, in the form of Artemis Fowl and Half Moon Investigations. Therefore I am delighted to learn, via Crime Always Pays, that Colfer is planning to write "an adult thriller." If that book is as good as "Taking on PJ," adults have something to look forward to. P.S. : Artemis Fowl and Half Moon are pretty fine, too. It's the season of lists, and It's a Crime! (or a mystery...) offers one of the cleverer lists to be had. The enterprising blog keeper got hold of a passel of British and Irish crime writers, asked each what he or she would recommend for holiday gift-giving, and is posting the results as a series of mini-reviews. Authors who have replied so far include Ann Cleeves, Brian McGilloway, Steve Mosby and Donna Moore. If you can't figure out what crime fiction to give friends and loved ones, let some top-flight authors offer their suggestions. I wasn't there, but Karen Chisholm of Aust Crime Fiction was. Read her entertaining and informative report here. One pleasant surprise for this casual Rankin reader is that the man apparently has quite a sense of humor. Anyone who can swap jokes with Shane Maloney must be quick-witted indeed. Historical crime fiction: Does the crime fit the time? I pondered the question of what makes good historical crime fiction recently after reading Ariana Franklin’s Mistress of the Art of Death, as I had from time to time previously with respect to other books. I realize now why the book worked: the crime fit the time. It’s 1170, and the Jews of Cambridge have been accused of murdering children. England’s King Henry II, for whom the economically active Jews are a source of tax revenue, wishes to clear them, if possible, and he sends for the book’s title character, who sets the investigation in motion. Humans have likely been killing one another forever, so an author who sets a story in a time other than his or her own has one big question to answer: Why one period over any other? Why set a story in 1170 rather than 1270, 1370 or 1970? Franklin set hers at the time and in the place where the slander arose that Jews killed Christian children for ritual purposes. Henry’s motive for wanting to solve the case is not just plausible, but plausible historically. I can think of one other author whose historical crime fiction similarly seems perfectly suited to its period: Carlo Lucarelli. What about you, readers? What historical crime fiction is not just a good read, but could not have been set in any other period? There’s plenty of humor in The Coroner’s Lunch, Colin Cotterill’s first novel about Dr. Siri Paiboun, sole coroner in Laos. Some of the broadest jokes are at the expense of communist officials and functionaries. There’s plenty of humor in the fourth Siri novel, Anarchy and Old Dogs, as well, but the humor is directed more at politics than politicians and thus dugs deeper. In this idealistic state, Civilai had chosen to ignore that absence in Laos of one of the fundamental components for a successful communist revolution. There was no rebellious Lao proletariat. There were no factories in which to organize unions, and hardly any working class. ... But by the time the two young men arrived back in Asia in 1929, the seeds of revolt had been planted in their fertile minds. Communism would save their repressed countrymen whether they liked it or not. Haeng held out the book. That’s all delightful, I think, and it edges Anarchy and Old Dogs closer to satire than the earlier book. What other crime fiction does this? What other crime writers are satirical, aiming at serious targets, while retaining their sense of humor? The fifth and last copy of The Redbreast has been awarded. Thanks, all, for entering , and keep on reading! Last copy of "The Redbreast"! 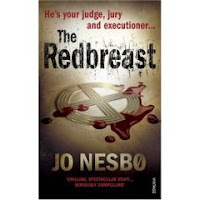 Four copies of Jo Nesbø's The Redbreast have flown out the door already. You can win the fifth and last one. Details here. Dame Agatha Christie will probably still be making news at the end of days or the closing of The Mousetrap, whichever comes first. A piece in the Spectator, on the other hand, accords Christie a kind of moral superiority over Dashiell Hammett and Raymond Chandler because, the writer says, she took murder more seriously and found it more shocking than they did. (Hat tip to Petrona, where I found the article.) The writer exaggerates, possibly to the point of misconstruction, Chandler’s famous statement about motivation for murder in crime fiction, but the argument is nonetheless worth reading. Somewhere between Temple’s Christie-is-bad argument and the Spectator’s Christie-is-good is Colin Watson’s that Christie could be sensitive, savvy, disingenuous, and, just possibly, not above a spot of pandering. Once I have you here, readers, who else in crime fiction has sparked such widely divergent opinions? It’s a beautifully paced story, the father-and-son, police inspector-and-mystery writer team playing off one another, their successive accounts and theories of a murder at a student party building toward the theory that proves correct. That's apparently the way it was done in the Ellery Queen stories, which I may just have to investigate now that I've read one of their descendants. More broadly, the crime tale whose action consists in characters telling a story goes back before Ellery Queen to Poe’s C. Auguste Dupin. This site proposes yet another plausible influence on “An Urban Legend Puzzle”: Seicho Matsumoto. I found the blend of venerable technique and thoroughly modern characters (cell phones, drugs, stress) bracing, and if that’s what “New Traditionalism” means, I want to read more of it. And here’s your question, readers: What crime stories can you think of, thoroughly modern stories, not deliberate nostalgia pieces, that nonetheless hark back in some way to older crime fiction? Send your answers to detectivesbeyondborders("@" symbol)earthlink.net. Jo Nesbø's The Redbreast is a chilling, gripping, atmospheric, psychologically acute decades-spanning thriller and mystery spiced with touches of romance and humor. It's a hell of a book, and, if you live in the UK, Europe, the Commonwealth or Canada, you can win a copy here, thanks to the good folks at Random House in the UK. The book concerns a string of killings in 1990s Oslo precipitated by strange activities on the cold, lonely Eastern Front in World War II. Claim your copy by answering this pertinent question: Which Norwegian politician's name became a synonym for traitor thanks to his collaboration in the Nazi occupation of Norway? Read more about The Redbreast — and find a clue to the competition question — here. Click here to watch a promotional video for The Redbreast. The video offers an accurate reflection of one aspect of Nesbø's multifacted novel. How does an author of historical crime fiction avoid a jarring clash between the sensibilities of the time depicted and those of the time in which he or she writes? Ariana Franklin attacks the issue from the beginning of Mistress of the Art of Death, observing a group of pilgrims returning from Canterbury in 1171 wearing rich tokens of the martyred Thomas Becket and observing that "the Canterbury monks must be raking it in" – but leaving it for readers to reflect, as she clearly wishes them to, on the irony of the church scapegoating Jews for, among other things, alleged greed. The title character, Adelia Aguilar, is a doctor from Salerno summoned to Cambridge by King Henry II to investigate the mutilation murders of a series of children. As was often the case in England in that period, the local Jews are accused of the crimes. This displeases Henry, for whom England's Jews are a considerable source of tax revenue. With forensic pathologists in short supply, he sends to a more enlightened realm for a master of the art of death, a physician to whom the bodies of the young victims will yield up their secrets and reveal the truth about who killed them. But instead of a master, the King of Sicily sends a mistress. Adelia's difficulties practicing her art in a country where female physicians are unheard of are a recurring motif, and not just at the hand of the novel's benighted Christians. The chief of Cambridge's Jewish community refuses to allow her into the room where a dead man lies, forcing her to send male helpers into the room to report on the body's condition and carry out an examination at second hand, according to her instructions. Adelia, an outsider in several ways, is Franklin's mouthpiece for commenting on unfortunate (and fortunate) aspects of twelfth-century English society, and it is a mark of Franklin's ability to spin an entertaining story that she does not hit readers over the head with her modern attitudes too often. She manages this, in part, by rendering a convincing picture of twelfth-cenury Cambridge, sights, sounds, smells included. And, when she uncovers the truth about the murders, the killers' motives seem thoroughly contemporary. But why not? Just because certain depravities were beyond the power of those not involved in them to imagine does not mean they didn't happen, or that "good" people did not perpetrate them. And now, readers, think of historical crime fiction you've read. How does the author manage the difficult feat of combining contemporary perspective and historical setting into a story that works? Is he or she able to make the setting both convincing and accessible? I recently threw a bouquet at In Reference to Murder. Today, I was impressed again. In honor of Veterans Day in the U.S., the site offers a list of crime novels with veterans as protagonists, grouped by war from the Civil War through the Gulf War. You'll also find biographies of a few prominent crime writers who served in the military or whose protagonists did. The post makes enjoyable reading and might help you think about certain books, authors and characters in a new way. With a hat tip to the Bookwitch blog comes the news that Eoin Colfer has made the long list for the 2008 Carnegie Medal, awarded to the best book for children or young adults published in the UK. I've written about Colfer often on Detectives Beyond Borders, and I expect to read more of him soon. I discovered his work in the Dublin Noir anthology (not a book for children), liked it, looked for more of it, and, though youngsters everywhere will consider me hopelessly out of it, was surprised to discover that he wrote for children. Well, a writer is a writer no matter whom he writes for, and Eoin Colfer is a writer, all right. Best of luck to him! I've been trying to think of a suitable occasion to spotlight In Reference to Murder, which I added to my blog roll not long ago. But the site offers such an interesting collection of miscellany that no one time seemed right. So I’m waiting no longer. Go have a look. And that’s just the side bars. The posts make good reading, too. One that attracted my attention concerned the Australia Sisters in Crime organization’s Davitt Awards. Among the winners, for best true-crime book, was Karen Kissane, “a journalist for 28 years and law and justice editor of the Age.” The things that a serious newspaper can do! … especially if your area is East Asian studies. After a long, drama-packed, psychologically compelling buildup, a murder has finally been committed in Akimitsu Takagi’s The Informer. The first named police officer on the scene is a chief detective, followed only afterward by the homicide inspector who takes charge of the investigation. Here is where the sociology comes in. The motif of a superior officer given unexpected priority repeats a pattern I’ve noticed in my admittedly limited experience of Japanese crime stories. In Akira Kurosawa’s movie Stray Dog, the senior officer, played by Takashi Shimura, guides the junior, played by Toshiro Mifune, investigating with him, interrogating with him, and keeping him in line. If my memory serves me well, a senior officer also plays an especially prominent role in at least one of Seicho Matsumoto’s novels as well. These instances all seemed a contrast to what I'm accustomed to, in which a police novel has one lead investigator. In the case of The Informer, the contrast with American and British police procedurals seemed especially marked. In murder mysteries from the U.K. or America, if any police are named as appearing on the scene before the lead homicide investigator, they are likelier to be of lower rank, a patrolman or a constable, rather than higher. Your job, readers, is to help me figure out if this means anything and, if so, what? Does it reflect differences between Japanese and Western police procedures? Differences in the way Japanese storytellers think about authority? Is it even typical of Japanese stories at all, or is it just a quirk of the few that I know? I’m just a few chapters into this 1965 mystery of murder and industrial espionage, but it took far less than that to see how skillfully Takagi humanizes what could easily be a remote subject. The protagonist, a disgraced former stockbroker named Shigeo Sagawa, has an endearing love for the market, so much so that a reader may almost feel sorry for him now that he can no longer trade shares. His readiness to jump from self-pity to a willingness to betray friends, sometimes within the space of a single sentence, makes him a character of compellingly human weakness. No doubt this will tighten the emotional screws on the reader once the schemes into which Sagawa lets himself be manipulated slip beyond his control. And here’s where you come in, readers. By coincidence, perhaps, the only other business-crime story that comes immediately to mind is also Japanese – Akira Kurosawa’s movie The Bad Sleep Well. Since I’m such a newcomer to the world of business as a setting for crime stories, I’ll ask you to help me out. What other crime novels, movies or stories have used the corporate world as a setting? What makes these stories work? And, if they are primarily crime stories rather than thrillers – and don’t ask me to define that term here – what makes them so? I'm back in Scandinavia and in the countries that Scandinavians settled for this post. First, another brief passage from Iceland's great Njal's Saga, composed around 1280, set about three hundred years before then, and full of more killings in any number of its short chapters than contemporary Iceland probable sees in a year. `Your mother,' said Gunnar, `will no doubt see to it that this game is played by two.'" Back in the present, to the the Fall 2007 issue Mystery Readers Journal. Editor Janet Rudolph made a decision that makes the issue an especially interesting experience for readers of international crime fiction: She does not restrict herself to fiction that has been translated into English. Thus, for example, Paula Arvas offers insights that may help readers develop a sense of Finland and its fiction even if they can't read the language. "Finnish crime fiction," she writes, "differs from Swedish crime fiction typically in that Finnish writers often use criminals, like small time crooks, as their central characters." That might make sense to anyone who remembers my comment about Tapani Bagge. Some of his short fiction is available online; Arvas discusses his novels, not yet published in English. Elsewhere in the issue, you can read about a very early crime novel set in the very far north, and the amusing lament of an author who bemoans "A Depressing Lack of Crime" in her native Iceland. Perhaps the biggest treat for the many fans of translated Swedish crime fiction are two bibliographies, one of Swedish crime fiction translated into English, another of reference sources about Nordic crime fiction. Lots of people in lots of places, it's nice to see, take Nordic crime fiction seriously. P.S. One of the issue's articles is called "Have You Driven a Fjord Lately?" If you can resist that, you are made of stronger stuff than I. You know the word verification that many blogs ask for as a final step before your comment appears, those random strings of characters meant to discourage spambots? Do those strings ever seem not so random after all? 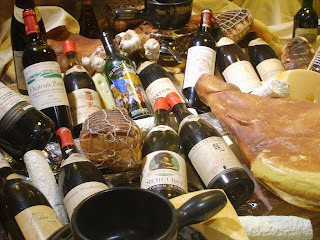 Recently I completed a comment about a fellow blogger’s vacation in France, and Blogger asked me to verify the comment by typing “leguf,” which sounds like a portmanteau of the French words for vegetable (légume) and beef (boeuf). Maybe it’s French for veggie burger. And now, readers, take a moment from your busy day to tell me about random character-verification strings you've seen that seemed to carry a message. 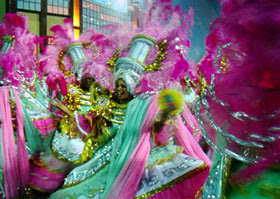 It's taken me a while to post about Barbara Fister's Carnival of the Criminal Minds because I was slow to figure out how blog carnivals work. Now that I have, though, I can tell you that they are a supremely practical way to cope with the surfeit of information in blogland. Quite simply, a blog carnival lets someone else do the work of finding and highlighting some of the best of what's out there. In this case, a revolving cast of someones does the work, starting with Karen C., keeper of AustCrime, that compendium of information about Australian and New Zealand crime fiction. Next up was J. Kingston Pierce of the Rap Sheet, and the current host is Julia Buckley of Mysterious Musings, pointing the way to a feast of blogs about writing, publishing and crime fiction. The three hosts to date have linked to some of my favorite bloggers and, more to the point, to some new ones that look interesting. And that's what makes a carnival fun. Back in September, I posted some comments about elements of Hamlet and Macbeth that would be right at home in crime fiction. And why not? Revenge, guilt, violence, murder. It amazes me that no one in Kansas or Pennsylvania has agitated to get moral degeneracy like that out of our good American schools. Hallgerd was outside. "There is blood on your axe," she said. "What have you done?" “I have now arranged that you can be married a second time," replied Thjostolf. And now, readers, let's hear from you. What classics of world literature belong on a crime lover’s bookshelf? Some things are too good to leave in comments. Instead, they demand posts of their own. Such is the case with Peter Temple’s caustic review of Laura Thompson’s biography of Agatha Christie, to which a reader kindly alerted me earlier this week. "Christie's brother Monty went to Harrow. A hopeless incompetent, he then found accommodation in the British army, a traditional sheltered workshop for upper-class dolts." "Mildly deranged and possibly on substances, he amused himself by taking pot shots at the wobbling backsides of the local matrons. True to form, he missed." "It was, of course, written in the stars that Archie, employed by a company with Imperial in its name, would betray her by shagging his secretary." "Sadly, Thompson thinks Tasmania is its own nation state." Christie was a woman of narrow views, ridiculous plots, and a prose style that could have used trimming and toning down, according to Temple. As for her biographer, Temple excoriates Thompson for creamy, cloying and gushing style and, more seriously, for her habit of assuming that passages in Christie’s novels explain Christie’s life. That's tough but fair. And fun to read. And now, readers, don't restrict yourselves to crime fiction on this one. Let's hear the funniest, harshest, most caustic or widest-of-the-mark critical putdowns you have ever heard or read.